The Anopheles barbirostris group is widely distributed in Southeast Asia. Although seven species have been formally described, a molecular analysis of the rDNA ITS2 and the mitochondrial cytochrome oxidase I gene suggests that the group includes species that are morphologically very similar or identical. We have previously shown that species in the Anopheles barbirostris Subgroup have an exceptionally large ITS2 (>1.5 kb), greater than in any other Anopheline group. However, the molecular processes responsible for generating such a large ITS2 have not previously been explored. To determine the processes by which this large ITS2 is generated, we examined the sequence and secondary structure of the ITS2 of 51 specimens from five species of the Anopheles barbirostris Subgroup. These include the anthropophilic species An. campestris and three morphospecies of the Barbirostris Complex: An. vanderwulpi, An. barbirostris I and III, together with a previously undescribed member of this group (Clade IV). All the specimens were found to have an ITS2 greater than 1.5 kb in length. The possibility that the spacer sequences amplified were pseudogenes was examined and discarded. The large size of ITS2 in the species studied is due to the presence of internal repeats of approximately 110 bp in length, confined to the central region of the spacer. Repeats varied markedly between the species examined, with respect to their organization, number and sequence similarity. The nucleotide diversity increased in direct relation to size variation and the presence of non-repeated elements. A secondary structure analysis showed that the repeats form hairpin structures with a wide range of free energy values. These hairpin structures are known to facilitate the subsequent processing of mature rRNA. An analysis of the repeats from the different species suggests they originate from a common ancestor, with the repeats appearing before speciation of the Barbirostris Group. 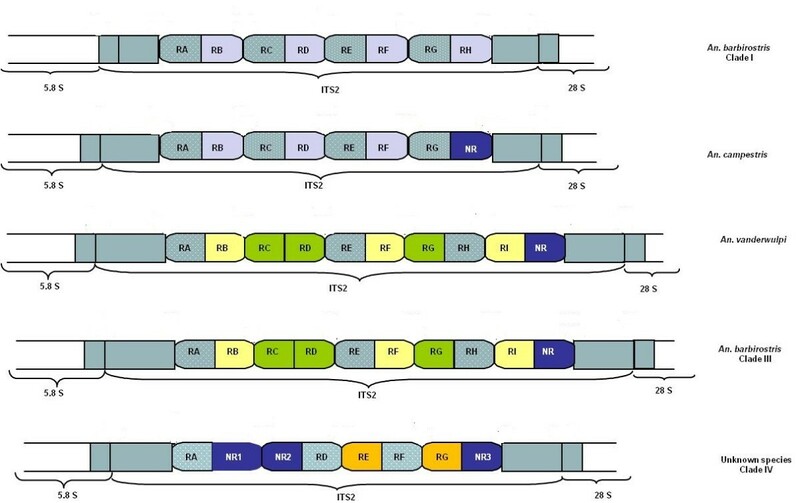 In the ribosomal genome, the first and second internal transcribed spacers (ITS1 and ITS2) are located between the genes coding for 18S, 5.8S and 28S in the ribosomal DNA cluster. Although spacer sequences are not present in the mature ribosomal RNA molecules, they mediate the cleavage of the great RNA precursor  and form stable secondary structures . There is evidence that the deletion of ITS2 affects the maturation of both the small and large subunit rRNA . Whilst many mutations become fixed in a population through natural selection and genetic drift, the non-coding spacer regions in ITS2 evolve through a pattern of concerted evolution . Typically, ITS2 exhibits a low level of sequence variation within species and a high level of divergence between species. It is this feature that renders the region useful to infer phylogenetic relationships in different taxa, including insects . In Anopheles species, ITS2 has proved valuable for distinguishing members of sibling species complexes [6–8] and is the most commonly used marker for the design of species-specific PCR primers for species discrimination . The Anopheles barbirostris group is distributed in the oriental region . Some of its members have been implicated in malaria and filariasis transmission in Southeast Asia [11–13]. Seven species have been formerly described: An. barbirostris, An. campestris, An. donaldi, An. pollicaris, An. franciscoi, An. hodgkini and An. vanderwulpi, the latter species being found in sympatry with An. barbirostris sensu stricto in Eastern Java. Anopheles campestris is considered the most anthropophilic of these species. Variations in habitat, resting behaviour and feeding preferences have been reported in the Anopheles barbirostris complex [16–18]. A molecular analysis of ITS2 and the cytochrome oxidase I (COI) gene region confirmed that the morphospecies An. barbirostris comprises at least three morphologically identical species, including An. vanderwulpi. In addition, one species, (Clade IV of Paredes-Esquivel, 2009), shares morphological characters with An. barbirostris and An. campestris. All species in the Barbirostris Subgroup have a large ITS2 (>1.5 kb). The size varies between Clades, namely: Clade I, 1545 bp; Clade II, 1727 bp; Clade III, 1730 bp; Clade IV, 1583 bp and An. campestris, 1519 bp. ITS2 sequences of considerable size have been documented in other Anopheles species. Anopheles crucians species B has an ITS2 of 1012 bp . This length was the result of a complex array of repeats in different combinations. In Anopheles beklemishevi, a member of the Maculipennis Group, ITS2 comprises 638 bp, including two repeats of about 140 bp of similar though not identical sequence . Similarly, An. fluminensis from Bolivia has been reported to have three repeats of 125 bp each within an ITS2 of 596 bp . In Anopheles species of the genus Cellia, a series of internal repeats has led to a large ITS1. ITS2 of considerable length have also been seen in other insect species [8, 22, 23]. In this paper we establish that the outstanding size of ITS2 in the Barbirostris Subgroup is due to the presence of DNA insertions that occur as repeated units located in the central region of the internal transcribed spacer. These vary in copy numbers and organization. To determine whether these mutations affect the stability of the ITS2 and to discard the possibility that they were pseudogenes, i.e. non-functional relatives of genes, we analysed their secondary structure. We have carried out a comprehensive analysis of these repeated elements and discuss their origin in relation to the evolutionary history of the Barbirostris Group members. The species examined were members of the Barbirostris Group studied by Paredes-Esquivel et al. (2009): Anopheles barbirostris clade I collected from Kalimantan (Indonesia) and Mae Hong Son (Thailand); An. vanderwulpi from the island of Sumatra (Indonesia); An. barbirostris clade III, collected from Mae Hong Son, Sa Kaeo, Tak and Kanchanaburi (Thailand); an unknown species clade IV, with mixed characters between An. barbirostris and An. campestris found in Sumatra and Trat and Sa Kaeo (Thailand) and finally An. campestris collected in Sa Kaeo. These species were identified based on the analysis of the COI, ITS2, combined with morphological examination of adult specimens. GenBank accession numbers, sequence sizes and place of collection are summarized in Table 1. Detailed DNA extraction and amplification procedures are described in Paredes-Esquivel et al. (2009). Sequence alignment was complicated by the presence of internal repeats. BioEdit v 5.0.6. (Hall 1999) was used to align sequences manually and to determine GC content and length. Boundaries of the ITS2 region were identified in comparison to sequences from Anopheles gambiae (GenBank accession number X67157.1) . When the regions containing the repeats were removed, sequences could be aligned with ClustalW . The substitutional rate in the conserved 5,8S and 28 S regions was analysed in detail to discriminate functional genes from pseudogenes. Repeats were found using the Tandem repeats finder program: http://tandem.bu.edu/trf/trf.html, although an exhaustive visual examination was also required. Nucleotide diversity (π) was calculated with program DNASP5.101  to determine the degree of polymorphism within each type of repeat. This is defined as the average number of pairwise nucleotide substitutions divided by the length of the sequence (π = П/L) . Sequences were folded using RNA Folding Form (version 2.3 energies), from the Mfold web server , located at: http://mfold.rna.albany.edu/?q=mfold/RNA-Folding-Form2.3. Default parameters (37°C with 5% suboptimal folding) were used to fold sequences. This program provides with several tentative secondary structures for a wide range of free energy values. Only the ITS2 region was included in the analysis. BLAST searches were carried out to identify sequence similarities. A Bayesian analysis using Mr Bayes 3.2  was carried out to determine phylogenetic relationships among repeats. For this analysis, the Monte Carlo (MCMC) chain length involved 500,000 generations, with trees sampled every 100 generations. The analysis was repeated twice to confirm topologies. Posterior probabilities were employed to test statistical support for clades. Trees were visualized using the FigTree program http://tree.bio.ed.ac.uk/software/figtree/). The fifty-one specimens identified as five members of the Barbirostris Group included 47 haplotypes, thus the majority of haplotypes contained a single specimen. The G + C content varied between 52.3% and 55.9%, similar to that found in other Anopheles species. All specimens showed an exceptionally large ITS2 amplicon. The size of ITS2 in the members of the Barbirostris Group examined varied markedly in size: Clade I c. 1543 bp., Clade II 1727 bp, Clade-III had a similar ITS2 size ~ 1730 bp but differed in 30 fixed substitutions. In Anopheles campestris ITS2 was 1519 bp long whilst in the unnamed member of the Barbirostris Group, Clade IV, ITS2 was 1583 bp. (Table 1). The exceptional length of the ITS2 region was found to be due to the presence of repeated elements, located at the centre of the ITS2, occupying 55% to 61% of the total length of the spacer. The number and organization of the repeats varied between species (Figure 1 and Table 2). In Clade I, eight repeats, organized in two groups comprising four repeats each, were present. There was no length variation in these repeats, being 112 and 108 bp long for types 1 and 2, respectively. Repeats in Anopheles campestris were arranged in a similar manner, except that the last repeat at the 3′ end turned into a non-repeated element. The presence of a single insertion/deletion event resulted in length variation in these repeats (Table 2). Anopheles vanderwulpi and Clade III showed a similar arrangement of nine repeated elements of three types. In both of these, sequences differed by several nucleotides. Non-repeated elements were also present in these species. Finally, the unknown species of the Barbirostris Group (Clade IV) contained five repeats of two types and varied sizes and three non-repeated elements (Figure 1). Most indels were located at the 3′ end of the repeat sequences in species where indels were found. Showing location of repeats in ITS2 in five members of the Barbirostris group. Repeats (R) are symbolized with letters indicating position from 5′ end of ITS2 (A being closest). Non-repeated elements (NR) are located at 3′ end. Similar filled patterns represent similar sequences. *excluding sites with gaps/missing data. Table 2 shows the nucleotide diversity of the different type of repeats found in Barbirostris Group members. The nucleotide diversity π increased in direct relation to size variation and the presence of non-repeated elements. The lowest π values were observed in repeats of Clade I and An. campestris, whereas the unknown species Clade IV showed a high degree of polymorphism, particularly in type 2 repeats. A GGGTGTG motif occurred at the 5′ end of most repeats. Although this motif was common to all species, in some cases variations of this motif were also observed (GGGTGGT in An. campestris, GGGTGGG in clade-I and An. vanderwulpi, GGGTGCG and TGGTGTG in the unknown member of the Barbirostris Subgroup). Using default parameters, most repeats formed long hairpin structures with a wide range of energy values. Results varied only in the number of hairpins that repeats formed, these being more evident in Clade I, Clade III and in An. campestris. At the base of the hairpin stem there was a motif GGGTGTG (or similar) at one side and a palindromic sequence on the other side of the stem. As an example Figure 2 shows the disposition of the hairpins in Clade I, at the lowest free energy value. Interestingly in this species each hairpin has a similar structure with three internal loops located close to the top of the hairpin (Figure 2). Stable RNA secondary structures are characterised by having low energy values. Energy values ranged from 593.6 to 629.4. Nevertheless, repeats formed at least 3 hairpin structures in all 25 resultant secondary structures, the only difference being the number of hairpins formed. Secondary structure reconstruction of ITS2 in Clade-I of the An . barbirostris subgroup. The motif GGGTGTG is represented with a rectangle. Each one of the repeats A, B, D, E, F and G form hairpin structures. Among members of the Barbirostris Group, An. barbirostris Clade III has the largest ITS2 recorded so far in Anopheles species (~1730 bp). The large size of ITS2 in members of the Barbirostris Group (>1.5 kb) results from the presence of DNA insertions, comprising tandem-repeated elements of c.100 bp located in the centre of the spacer region. In the genus Anopheles the ITS2 is characterized by a very low level of polymorphism between species, even between cryptic species . Despite reports of intra-specific and intra-individual variation , ITS2 is still widely used to infer phylogenetic relations among species [30, 31]. In the Barbirostris Group, the presence of repeats did not affect tree topology, and this was consistent with results from COI analysis (10). Given the high rate of substitution, we examined the possibility that the ITS2 of members of the Barbirostris Group were pseudogenes. This hypothesis was discarded for the following reasons: 1) There was a low rate of substitution in the flanking 5.8 and 28S regions which were amplified, these comprise 90 nucleotides of the alignment; 2) Hairpin structures were formed for all species in high number, at the lowest free energy values. Pseudogenes in ribosomal spacers tend to accumulate random substitutions at high rates, whereas functional ITS regions show many hairpins with compact stable secondary structures . Even when a point mutation was observed, it can be assumed that the structural integrity was not affected by the insertion of long repetitive elements, as large spacers seem to be less affected by mutations than shorter ones . Long ITS2 regions have been found in distant taxa including oomycetes  and amphipods . They have also been reported in several arthropod species, including rhipicephaline ticks  and insects of various orders [36, 37]. Repetitive DNA regions of considerable size have also been documented in the ITS2 of other Anopheles species [8, 19, 20]. Little has been written to explain the origin and function of repeated elements in ribosomal spacer regions. Secondary structure reconstructions show that repeats found in members of the Barbirostris Group form hairpin structures at a wide range of energy values. Since the Mfold server does not produce a single ‘correct folding’, many configurations obtained with the minimum free energy values were examined. It is known that hairpin structures are related to functional ITS regions , although their functionality has not been fully elucidated. As stated by Paskewitz et al. in their pioneering study of the secondary structure of ITS1 in the Anopheles gambiae complex, conservation of hairpin structures in a wide range of energy values may indicate the conservation of functional constraints, possibly related to the maturation of ribosomal subunits. Long stem-loop secondary structures are also formed by the repeats found in the ITS1 of members of the An. punctulatus group . However, the repeats found in the Barbirostris group showed no similarity to repeats in An. punctulatus or An. gambiae. Furthermore, a Blast search failed to reveal any similar sequence in GenBank. A possible explanation for this is that similarities to other insertional elements, e.g. transposable elements, may be obscured by the high rate of substitutions present in this spacer, as has been observed in other taxa . 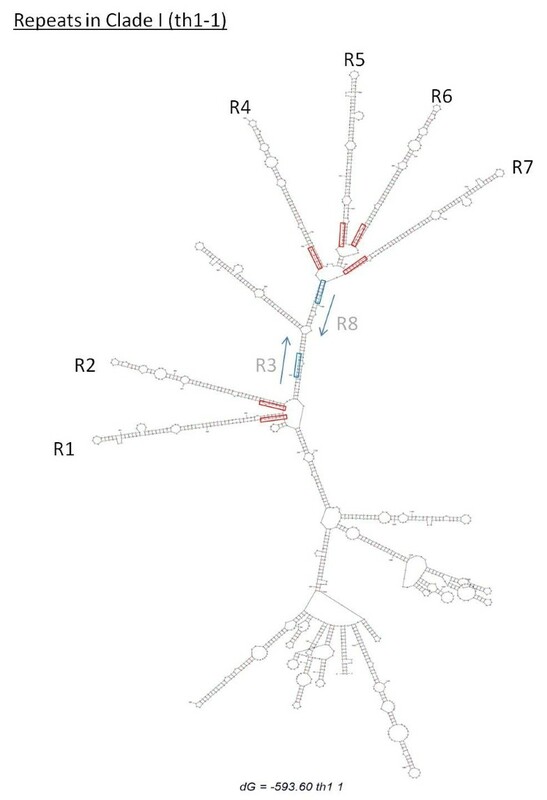 Variation in other regions of the ribosomal gene has been reported as a result of adaptations to changes in the environment. Thus in the parthenogenetic Daphnia pulex, longer IGS regions provide these organisms with the plasticity required to adapt to different environments . In Bryophytes, repetitive sequences in the rDNA appear to result from exposure to heavy metals. Whether insertion elements or adaptation to new environments affect the ITS2 region of members of the Barbirostris Group has yet to be determined. ITS2 in members of the Barbirostris Group is subject to a high rate of evolutionary change. We observed a high rate of substitution, even at an intraspecific level and incomplete homogenization of repeats. Nevertheless, when comparing the rate of substitutions at an interspecies level, ITS2 seems to evolve through a pattern of concerted evolution. Accordingly, repeated elements found were imperfect copies of an original one. This has also been reported in the long spacers of other taxa [22, 39, 40] and seems to be the result of replication slippage events . Hairpin structures appear to facilitate subsequent processing . Thus rRNA processing in yeast requires sequences and/or higher order structures within ITS2, an example of which would be the extensive folding of ITS2 sequences, bringing into juxtaposition those regions of mature 5.8S and 25S rRNA that must interact during processing. Thus rRNA processing requires sequences and/or higher order structures within ITS2. One example may be the extensive folding of the ITS2 sequences (see Figure 2), bringing into juxtaposition those regions in mature 5.8S and 28S rRNA that must interact but that are at a distance in the primary sequence. Nucleotide diversity varied considerably among repeat types. It was higher in repeats from An.vanderwulpi, Clade III and Clade IV, where non-repeated elements were observed and the length of the repeats varied considerably. On the other hand, the degree of polymorphism was much lower in An.campestris and particularly in Clade I, where indels were absent. Concerted evolution is a potent force in the formation of ITS2, but there are cases where concerted evolution is incomplete, as seen in Anopheles longirostris from Papua New Guinea . It is conceivable that concerted evolution is more effective in Clade I, leading to the stabilization of the repeats. This species is to date the most widely distributed member of the Anopheles barbirostris complex, having been reported in Thailand, Borneo (Indonesia), Vietnam  and in the islands of Sulawesi and Java, in the Indonesian archipelago . Indels did not affect hairpin structures, as these were located at the 3′ end, outside of hairpin structures. We postulate that repeat elements were present in the common ancestor of the species of the Barbirostris Group, before members of the Group underwent subsequent speciation. This conclusion is based on two principal facts; firstly repeats in all species were flanked by a common motif (GGGTGTG and variants) and more importantly, the Bayesian analysis shows that type I repeats present in An. campestris form a monophyletic clade with their homologous repeats in Clade I. We conclude that repeat elements were present in the common ancestor of species of the Barbirostris Group, before members of the Group underwent subsequent speciation. This conclusion is based on two principal observations; firstly repeats in all species are flanked by a common motif (GGGTGTG and variants) and more importantly, the Bayesian analysis shows that type I repeats present in An. campestris form a monophyletic clade with their homologous repeats in Clade I. Repeats form hairpin structures that are linked to the functional constraints on the internal transcribed spacer, since they are known to facilitate the processing of mature rRNA. CPE carried out the molecular studies and prepared draft Figures and Tables. HT assisted in the analysis of the data and their presentation. CPE provided an initial draft of the text. HT and CPE contributed equally to the final article and both authors read and approved the final manuscript.